You just have to laugh!! The Black Dog band pays tribute to some of the greatest classic rock bands os the 70..s, specially the studio work of Led Zeppelin. and took my first backstage photos. Note :- Photos on cd sleeve are not from these shows. 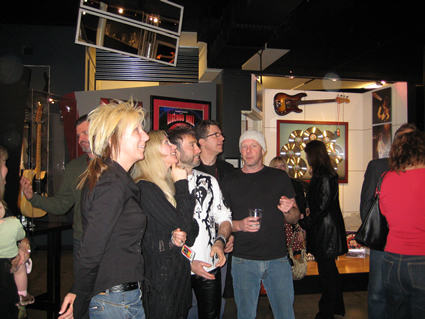 The Grand Re-Opening of the Fender Museum on February 9, 2008 was a phenomenal success! GetVegas play the "40th Anniversary Annual "FREE" Convention" @ The Park Hotel. Lots of news to come on these fantastic guys !!! Spanish Singer Jose Antonio Manzano is beeing away from the worldstage for to long in the last couple of years. Being the lead singer for some of the best spanish bands like Manzano, Banzai, Niagara etc., brought him to play the Monster of Rock Festivals in Spain, opening up for Whitesnake. Moved to Switzerland, he joined the band Emergency, which album became great reviews worldwide. In Spain he is still named the best rock singer in the land. I am pleased to announce this year's Convention. I am very excited by the fact I am going back to what was the original home of the Free Convention between the years 1987 and 2000. I am hoping that there will be at least 1 special guest appearance present. The event will run through to <?XML:NAMESPACE PREFIX = ST1 />1am on the Saturday morning as this final hour marks the official 40th Anniversary of Free's first get together at the Nag's Head at Battersby on 19.4.1968 .
at your peril. For more on this exciting band go on you tube & my space and then book your ticket!!! The 2006 Convention performance was probably one of the great Convention concerts, featuring great sets from 'FREEWAY' and 'HEAVY LOAD', I cannot recommend the DVD of this concert too highly to you, I find that I revisit the DVD regularly, when I want some 'Free' adrenalin in my veins! . I have a limited number of these DVDs available at £12 including p&p once they are gone there will be no further copies made, I have not recovered my costs in having this produced, so would appreciate anyone who orders a copy . The DVD also has a great cover/and also is a picture disc, again I will be supporting the Brainwave appeal through profits from the sale of the DVD -a stunning addition to your Free collection. PLEASE KEEP THE CONVENTION ALIVE BY YOUR SUPPORT. The Cannery Box Office at 702-617-5585 or toll free, 1-866-287-4643 Ticket prices do not include tax and applicable fees.